We hold a brief, collective meditation each Wednesday night at 9:00 pm. Join in from home, or wherever you are. Let's plan on a minimum of 10 minutes and allow yourself to come and go as guided. Holding the space for heaven on earth is a much-needed gift of service at this time of planetary changes and crumbling social systems. I ask each of you to do a protection (the one I use is available if desired), and then come into meditation holding the knowing of the perfection of all things as they are. Please acknowledge those who have rsvp'd each week, as well as the Ascended Masters and Archangels who will be joining us in spirit. It would be lovely for everyone to take a minute to leave a comment on the meetup site about their experience each week so we can see what others are witnessing. The collective energy of this gathering will continue to grow as we work together each week and more are called to join us. I hope to "see" you all on Wednesday nights! I have included the protection that we use at Kumara Center underneath the picture, for those of you who would like to have it. Mother-Father God, through the Great Central Sun Hierarchy, through the Office of the Christ, through the Order of Melchizedek, I call upon Archangel Michael to bring the saphire blue ray. Cut away, cut away, cut away anything in my four lower vehicles not emanating directly from my I AM presence. I now call on Archangel Zadkiel, Keeper of the Violet Flame; Blaze, blaze, blaze the violet flame through my four lower bodies. Transmute, transmute, transmute all the psychic debris Michael has cut free. I now bring forth the invincible Ring-Pass-Not and the Mirror Blue Light of Invisibility to completely surround me. I call forth a shaft of pure Christ light to surround me and to go down to the center of the earth, where I call on Archangel Gabriel to seal it. And, I ask the legions of Michael to completely surround this tube of light. 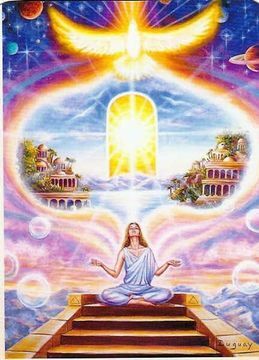 Now, I ask that my vibration be raised, high above the psychic and astral worlds, to the highest realm of Illumined Truth that I can attain at this time. And now, Mother-Father God, I place myself in service to you and humanity. I ask that only that which is direct from you be permitted into my perceptions and that all else of the Lower Mind be kept out. And I ask that only that which is direct from you be permitted through me. Because I have asked this, I consider it so. So be it!